Alberta students will continue to have affordable tuition and fees and better access to post-secondary opportunities thanks to legislative amendments. 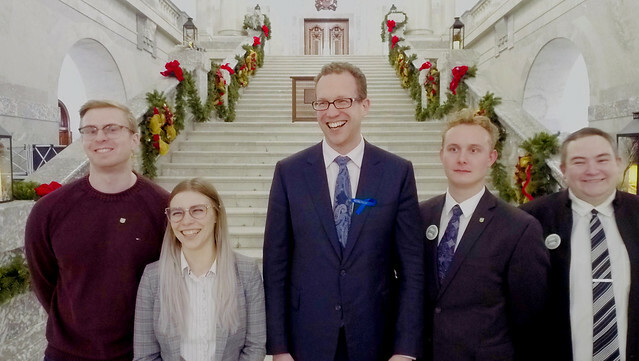 Minister Schmidt, Advanced Education celebrates the passing of legislation with post-secondary students at the legislature. An Act to Improve the Affordability and Accessibility of Post-secondary Education has passed third reading, setting the stage for a revised tuition framework and a more accessible system. The amendments to the Post-secondary Learning Act will protect students from unfair tuition spikes by aligning increases to Alberta’s Consumer Price Index, and allow the minister to order tuition freezes to ensure affordability for students. The changes also tie mandatory non-instructional fees to the actual cost of the services, and ensure they can be frozen to ensure affordability. For a fifth consecutive year, tuition and fees will remain frozen to ensure more students can afford a university or college education. University students taking an average-priced undergraduate program would save almost $2,000 on a four-year degree. In addition to predictability of tuition, students will have increased say in decisions that affect them with the requirement of written consent for new mandatory non-instructional fees. In addition, with the passing of the bill, post-secondary institutions across Alberta will be more collaborative and accessible for students moving across various institutions. This includes ensuring that post-secondary institutions can transition to universities to meet the needs of learners in every corner of the province. Once the bill receives royal assent, regulations will be brought forward to further govern mandatory non-instructional fees, provide increased predictability for domestic and international students, and foster more collaboration between institutions and students. Changes to the Post-secondary Learning Act will take effect Feb. 1, 2019. The changes are the result of consultations with students, faculty and staff. The consultations involved an online survey, which received more than 4,000 responses, and a number of focus groups.